It is going to take some time digest it all I think. But I wanted to put some photos up quickly for those who couldn't make the talks... and also for those who did. First up, confirmation that the cards people wrote on Thursday have been sent. At the end of the talk at the BPMA, three volunteers from the audience (Anna, Fran and Axel) wrote cards using some of the Edwardian techniques for writing postcards that we'd discussed earlier in the night. The volunteers agreed to enter into a deal.While the BPMA paid for the card and the stamp and they could send the card to whoever they wanted - I would read out the cards at the end of the evening to the rest of the audience.The idea was to explore the open form of the postcard, in that the message can be read by all en route to its destination. Anna wrote a gingerbread recipe to her friend in Dulwich, Fran a message to her future child (I got it in the end, Fran!) and Axel sent a very poignant note to her grandma. These cards are now in the possession of the Royal Mail. Once again, thanks to Laura and Alison at the BPMA for inviting me along to speak! I must admit I'm still on something of a high from Saturday's 'postcard tour' at the Gower St branch of Waterstone's. The people that came along were fantastic. Loads of great observations about the cards. In fact the event became a long chat as much as a tour. We walked around the store taking in the secondhand section, the philosophy and art departments, the fiction area and then back to the secondhand section for some biscuits and jam tarts. And all through the medium of different postcards. 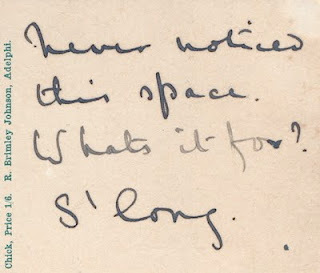 So for example, in the fiction department we discussed how postcards have been used as plot devices by authors like E. M. Forster. Lots to think about. I'm sure the experience will be a source of inspiration for a long time. But now for the very very exciting bit. Some great messages emerged as you can see. Lots of codes, lots of tilted stamps. And somewhat surreally of course, they are all in the same scrawling handwriting learnt at Longton County Primary school circa 1984. At the same time, though, there was a serious aspect to all this. Jamming Edwardian postcard writing with our very modern concern for what is public and what is private, made for interesting exchanges. One person described sitting down in the alcove of the store where we were based as "stepping into the confessional". That felt spot on. It was fascinating not just to see what emerged in the messages, but also how people engaged with the 'stranger scribe' scenario. Thanks again to everyone who came along, and to Jo and Emma for letting me do the tour in the store. Yes, let's do another one in the Autumn! Finally, this week has made me realise how much I enjoy this card sent to an R. Wade in 1903, a year after the postcard's reverse side was split to allow people to write both a message and an address on that side. 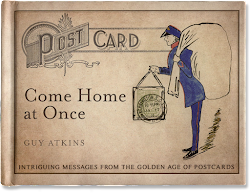 It's a great example of how playing with the form of something, whether it be 'the postcard' or 'the talk', can be a lot of fun. Making friends in London can be difficult. Getting a dog is a good start, I'll give you that.... oh hello, what's his name? Reading someone's else magazine on the Tube, less so... are you reading my magazine? why are you reading my magazine? But today I can reveal a new tactic: carrying a 4 foot tall, mock Victorian post box. Whether you're in a taxi, on the street corner or in a bookstore, people want to talk to you if you're being pressed into the ground by one of these. I've lived in London for 8 years and after carting one around this morning, I am left amazed by its power. Every door was opened for me, one woman wanted to know how I'd made it (for the record I admitted I hadn't). Several people even offered to carry it for me. Anyway, why was I carrying a mock Victorian postbox? On Saturday (28 May) at the Gower Street branch of Waterstone's I'm giving a 'postcard tour' of the shop. And at the end of the tour I'll be offering a free postcard writing service. 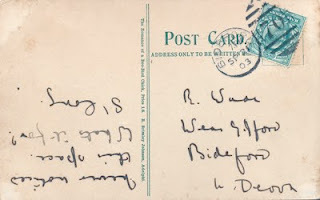 I'll pay for the stamp (well, the British Postal Museum & Archive will actually) and the postcard, but there's a catch. I'll be writing people's messages for them. Of course, to hand will be all the techniques of the Edwardians - tilted stamps, codes and other ways to play with the form. Hopefully I'll be able to put a few examples up of what people asked me to write next week. For more details click here or see the postbox in store. There are a few spaces still left on the tour. And then this Thursday (26 May) is my talk at the BPMA in Clerkenwell, London. Like the Waterstone's tour it's free but you do have to book. Click here for info on how to get a ticket. Meeting an author (or an artist) removes the distance we normally have from them when we consider their books (art). A dialogue is possible where it wasn't before. In the case of a book signing, however, it is likely to be an unbalanced dialogue which emerges. Loaded with the scripted thoughts of the reader/consumer and hurried by the queue behind, some of the distance remains. I went to see the Gilbert and George postcard art exhibition at the White Cube a few months ago, and thought it would be interesting to see them in person at their book signing at the Tate last week - not least as they too collect old postcards. I went, after a day in the library. Ricoeur, P., 1991. From Text to Action: Essays in Hermeneutics II. Evanston, Illinois: Northwestern University Press.